Valentine’s Day, Día de los enamorados, le jour de la Saint-Valentin is coming up soon. 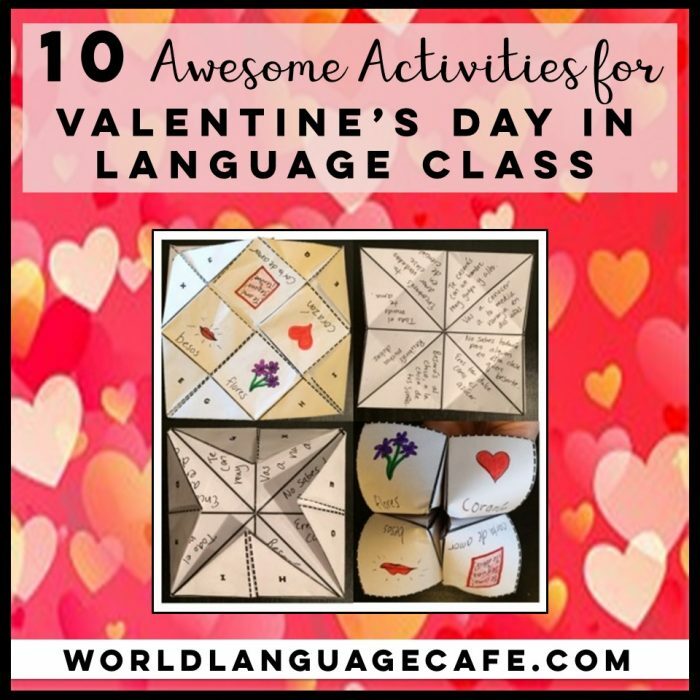 I LOVE teaching on this day – so much fun to incorporate French and Spanish love expressions into your classroom and to make even the mopiest of kids have a great day. Here are my 10 favorite ways to ensure the cheesiest, sappiest, funniest, most memorable Spanish Valentine’s Day or French Valentine’s Day ever! 1. 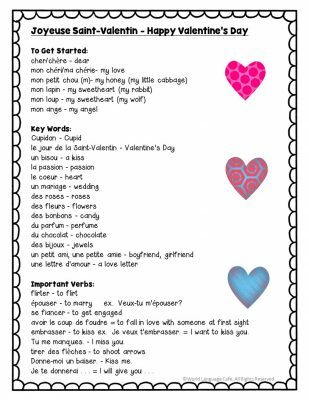 Learn some French or Spanish Valentine’s Day vocabulary and super cheesy pickup lines in the target language. * Je sais que le lait est bon pour le corps, mais dis-moi combien de lait est-ce que tu as bu? – I know that milk does a body good, but geez, how much milk have you been drinking? * Tu as un certain je ne sais quoi. = You have that certain something. * Moi, je brûle près de toi. (Victor Hugo) = I’m on fire when I’m near you. * No eres Google, pero tienes todo lo que busco. – You’re not Google, but you’re everything I’m searching for. * Eres mi media naranja – You are my soulmate. (the other half of my orange). * Las rosas son rojas. Roses are red. Las violetas, azules. Violets are blue. Y también eres tú. and so are you. 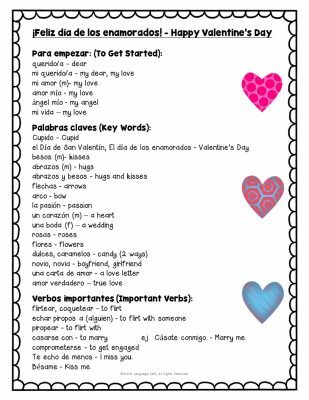 Get free French and Spanish Valentine’s vocab sheets in my Free Resource Library. 2. Make some Secret French or Spanish Valentine’s. Every student should get at least one awesome Valentine’s Day card so that they feel loved. Since many students feel uncomfortable making cards for other kids in class, take the pressure off by pairing them up randomly and having them sign the card from their “Secret Valentine”. I pair boys with boys, girls with girls, and boys with girls. Explain ahead of time that boys may get boys and boys may get girls. The boys especially think it’s really funny to send a lovey-dovey Valentine to another boy (as long as you have picked the names so it’s obvious that they don’t really like each other). When they’re done, they “mail” their cards, by handing them to you to deliver. Afterwards, they try to guess their secret Valentine’s. You can give a prize (an extra credit point, a piece of candy, etc.) for the cheesiest Valentine in order to encourage students to be over the top sappy and to use lots of new vocabulary. 3. To make it a day that your students will never forget, cheesy music is a must. I would love to hear about favorite love songs in German, Italian, and Portuguese, so please share your suggestions. 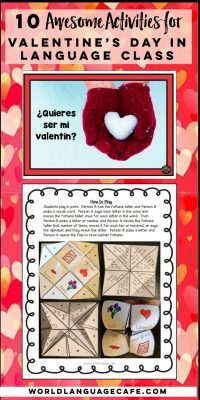 This year I made some French and Spanish Valentine’s Day classroom signs to post on my bulletin boards. I found quotes online, added pictures as a background, and put frames around them. You can print them on cardstock, laminate them, and hang them in your classroom. This is a great computer lab activity, homework assignment, or extra credit assignment. 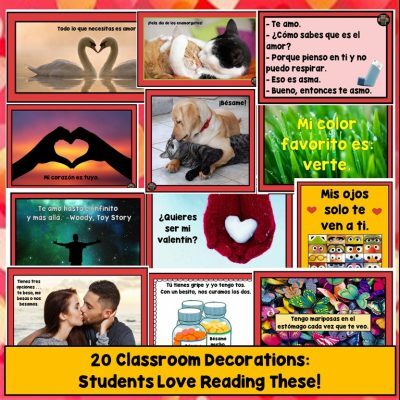 Have the students find any quote in the target language (inspirational, funny, romantic, etc. ), then find a pic to go with it. Great way to let them express themselves and to celebrate their uniqueness in your class – plus, free decorations for your bulletin board – always a plus. Día de los Enamorados Classroom Decorations – You have three options, I kiss you, you kiss me, or we kiss each other. 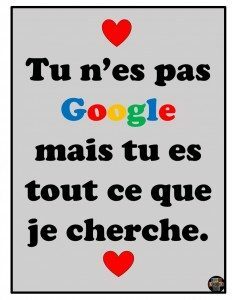 French Valentine’s Day Pickup Line – You’re not Google, but you’re everything I’m looking for. 5. 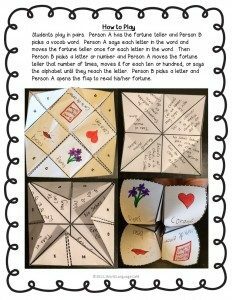 Pretend you’re back in elementary school and make a French or Spanish cootie catcher/fortune teller using Valentine’s Day vocabulary so student’s can predict their future love situations. 6. Try some speed dating! Line up your student’s desks and have them do 5-10 minute French or Spanish speed dates in the target language. They can write questions beforehand and stick with their own real answers, or invent a new persona for the dates. 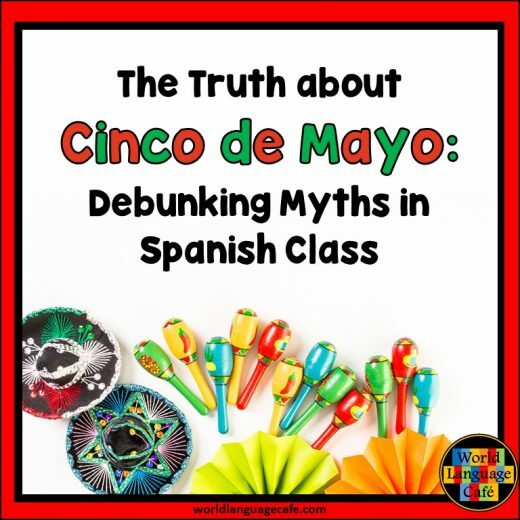 Great way to get your students talking in the target language. 7. 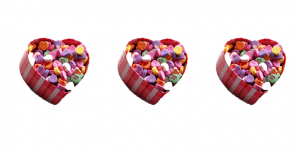 Buy candy hearts in the target language and pass them out. Pretty fun to try to figure out what they’re saying and pretty tasty, too. Here are the translations for the Spanish hearts which can usually be found in Target. Much trickier to find them for French and other languages. If you find a good source, let me know and I’ll add it to this post. Me gusta – I like it. Dale – Go for it. Amigo/a – friend CMO estás – How are you? Guau – wow Todo bien – It’s all good. Lindo – pretty/handsome ¿Qué tal? – What’s up? 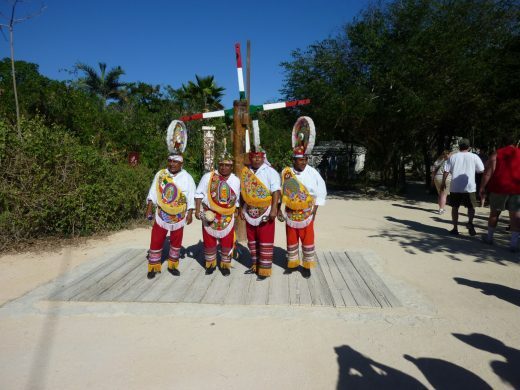 Jugar – to play No sé – I don’t know. 8. Make a Valentine’s Day craft. So many ideas on Pinterest, but I like making suncatchers with the word “love” or “I love you” inside to give as gifts to their families. 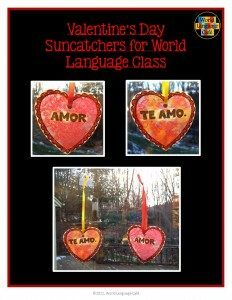 Cut out red hearts and a word or expression in the target language and then paste onto wax paper. Add crayon scrapings, place inside a paper towel and iron it all together. Cut it out, punch a hole, attach a ribbon and you’re all set to go. 9. 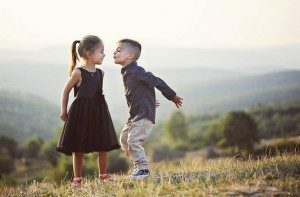 In French class, have your students practice “la bise” (greeting kisses on the cheeks) on each other. Have them practice girls to girls and boys to boys first. Make it big and exaggerated and silly at first and tell them how it can vary from 1 kiss to 4 kisses depending on the region. After they have practiced with their friends, make two lines and have them practice going down the line. 10. Have your students play MASH. Do you remember this game from when you were a little kid? Mansion, Apartment, Shack, or House? Here is a link to free instructions in Spanish. Have your students read the instructions in Spanish and then play. I couldn’t find instructions in other languages, but here are the instructions in English. If you’d like to do several of these activities, but don’t have time to prep them, I’ve compiled them into growing bundles (meaning you’ll get whatever I add in future years for free). 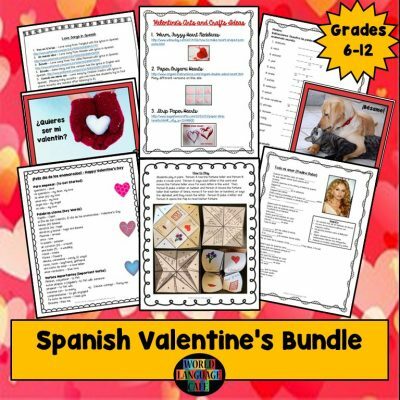 There are activities for all levels of Spanish and French and believe me, there are enough activities to fill your Valentine’s Day classes for the rest of your teaching career. 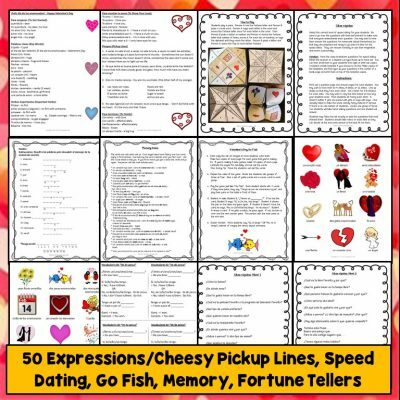 Remember to get your free Valentine’s vocab sheets in my Free Resource Libraries. Just sign up below. Wishing you a French or Spanish Valentine’s Day filled with love!